Several Top quality Friesians to choose from. All from small breeders and single horse owners. Respected Honest service since 1993 US Friesian Referal Service also new FriesianFinder, let me help find your dreamhorse. LESSONS: With Melissa Fischbach, Certified Classical Dressage Instructor. ~ The importance of position and balance, and how it affects your horse. ~ To ride with the horse in rhythm and self carriage. ~ To use clear, concise and minimal aids for desired results. ~ To reward for the effort and be pleased with the smallest achievement. ~ To learn and master techniques you can take home and utilize yourself. Monthly Clinics in Santa Rosa, Contact e-mail Linsa Fuetsch 707-588-9934. Roger Cleverly. Trains Horses, Ponies and Minis for Carriage Driving, and drivers for both pleasure and competitive driving. He also trains English saddle seat, Hunters and Jumpers, and reschools ex. track Thoroughbreds for second careers. Thoroughbreds and British Mountain & Moorland ponies are a specialty as Roger is from Britain, and was an amateur assistant in a racing yard for 13 years. 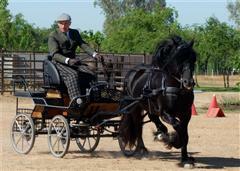 Roger is now a well known competitor in carriage driving competitions.